We are leading manufacturer of front signal lamps. We are offering our client an excellent quality range of Display And Signal Lamps. Light is better than any other medium for providing quick and meaningful messages, for giving warnings and for activating. The demands placed on display and signal lamps in terms of reliability and service life are very high indeed. We offer high quality signal lamp, which is made of high quality material. These are used in machines and can be offered as per the exact specifications of our clients. This signal lamp can easily be installed in any any model of crane or hoist. 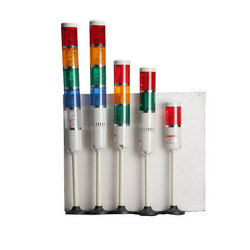 This signal lamp is made with precision and accuracy so that the best can easily be provided to the client. One can avail from us a quality approved assortment of LED Pole Mount Beacon. Owing to their top quality, our products are extremely praised amongst the patrons. Indicating lightsThis unit (LED type) giving a signal is used for achieving a goal of production per hour as workers to follow normal working process in production line and for manager to realize processing error immediately.